When life gives you lemons, make lemonade. Or so the proverbial goes. The lesson is clear: Stare adversity resolutely in the face and turn it into an opportunity. An upbeat and optimistic view of life is a precondition for getting out there and making it happen. However, it presupposes you have either been given lemons or you are even aware what a lemon is to begin with. Now this is all starting to all sound a bit cryptic. But this is not my intention. The point is: Do not wait to be given lemons. Go out and find them. If you start with a lemonade stand, you may end with an empire. Even if you’re relatively happy with your lot in life, if you yearn to enter the world of business, do so. This is literally what two entrepreneurs did in the small town of Fairbanks, Alaska. After converting a couple of old U.S. 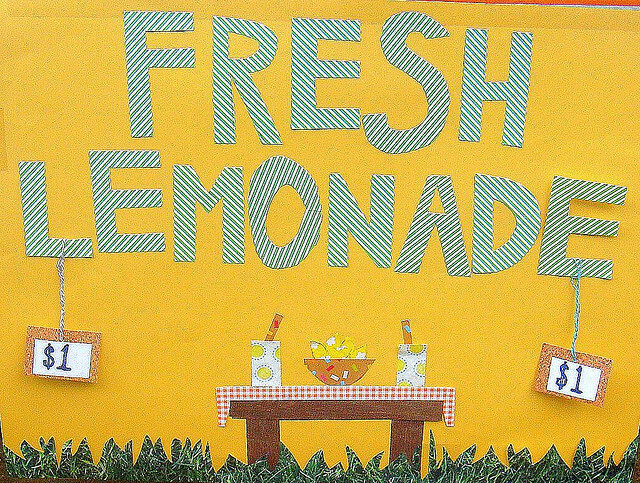 Postal trucks into mobile lemonade stands, they dispensed with their delicious and refreshing homemade drink at various locations around town. The initial issue — what type of product do you wish to sell? Is there a unique crop of lemons with which you require to recreate your grandmother’s age-old recipe? Maybe you will decide cost-effective lemonade is preferable, and you will use lemons you have appropriated from your neighbor’s backyard. Either way, formulating product is a fluid process and what you started out with may not be the final product. Necessarily linked to the creation of your product is pricing. You will be forced to consider the fixed and variable costs of your operation (i.e. sugar, lemons, water). You may start to wonder, are those special lemons worth it? If so, how will that change your pricing? Is there demand for product? Will you offer a discount for multiple cups? Where should trading begin? As in the world of property investment, location may be vital. It might also not be. You may find that your product is so great that people will come to you (see product creation above). If your product is similar to the rest of the market, will location become more of a critical issue? What is the most effective method of getting your name out there? Will you employ the use of social media? Or will you gain more traction by borrowing your cute niece to be the “face” of your outfit? You will perfect your sales pitch. You will learn each of the above does not operate in a vacuum, but rather your decisions regarding each may have an enormous effect on the other. Of course this is all metaphorical. You need not start with a lemonade stand. But start with something. Learning by doing is the oldest trick in the book for a reason. Don’t ignore it. Most of all, the whole thing will provide you with clarity and that is something you can only discover on your own. After the whole process is done, the key take-away you may have derived is to simply “be different.” To which another less well-known proverb may be handy: When life gives you lemons, make grape juice. Then sit back and watch the world wonder how you did it. Worst-case scenario? You may end up with a fridge full of lemonade. But don’t be perturbed. It might go sour, but your career won’t. You are now on the trajectory to entrepreneurial greatness. Hugh Griffiths is a 26-year-old corporate lawyer specializing in Mergers & Acquisitions, a freelance writer on all things business and a seriously amateur golfer. He is the founder of two startups, Inanimate Obits and Escape! He says Hello.